Our BMW R1200RT now has a name. Naming motorcycles is not as unusual as you think. For example, the R1200RT’s predecessor, our K1200LTE was “The Magic Carpet”. Since the motorcycle is German in origin the name of our R1200RT is “Die Eule” (pronounced dee oila) which in English is “The Owl”. How did it come to be named Die Eule? Well to understand how it got its name just take a look at the picture below. This might give you an ideal of how the R1200RT got named “The Owl”. If you’ve ever ridden in the cold, not cool weather, but cold weather then you’ve probably encountered a dripping nose. I don’t mean a runny nose like you get with a cold but an actually dripping nose like a dripping faucet. Yes it sounds gross but it’s probably happened to you when riding in the winter time. It’s really just a side effect of the cold air on your sinuses. You might think that the only way to prevent it is to put tissues up your nose! But there is not only relief but prevention available! On a toy ride just before Christmas the wife of one of the riders told some of us (and one poor guy who was really suffering from the drips) to just use one of the over the counter all day allergy prevention medicines such as Zyrtec. I thought to myself “You know, that might just work.” During allergy season I routinely take a store brand of Claritin with great success. In fact, the store brand is from a wholesale membership club so I got a good-sized bottle of 365 tablets! Here in the U.S. there are three name brand medicines available of Zyrtec, Claritin and Allegra along with store brands for all three. Claritin and Allegra both pride themselves as being “non drowsy”. I’ve taken Zyrtec in the past but have never experienced any drowsiness. All three boast 24 hour relief. Well last weekend when we went for an all day ride and knew the beginning and some portions of the ride could be cold so I started the day off with my store brand of Claritin. I’ll have to admit that the advice was right on the money and I didn’t notice a dripping nose once. Go ahead and give it a shot. If it doesn’t work for some reason, at least you have some allergy medicine for next spring and summer. Okay we’ve owned the new BMW R1200RT for a couple of months now. It’s still an awesome motorcycle. It also came with the whole list of options. I had always looked at and priced motorcycles of interest. I mean who among us hasn’t done that? The R1200RT has quite a list of options and like buying a car, buying a package of options is often the best way to go, price-wise. The motorcycle has a few options that I always figured that if I were to purchase the motorcycle that I’d “opt out” of a few of the options. But now that I’ve been riding it a while some of them are really nice, a few are even things that I’d probably get again. So this post is about some of the more major and innovative options. 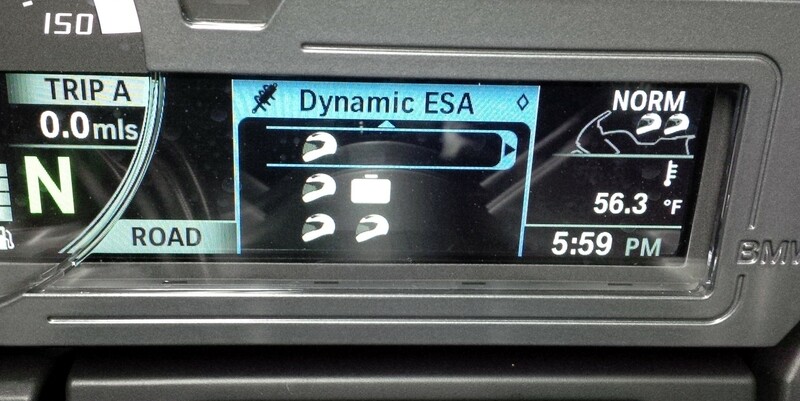 Dynamic ESA electronic suspension adjustment: This is one that I had always figured that I could do without. Boy was I wrong! I figured that I would just continue to adjust the suspension just like I had been doing (and the way the R1200RT does without this option) and just turn the shock pre-load adjuster. With ESA I just scroll through the menu and select the suspension setting for that ride. It’s simple to do. I select one helmet if it’s just me, two helmets if we’re riding 2 up or one helmet with luggage if riding one or 2 up with the side cases loaded. While the suspension adjusts you can actually feel the motorcycle move slightly underneath you. Then additionally you get to pick one of 3 setting of soft (comfortable damping), normal (normal damping) and hard (sporty performance-oriented damping). It’s so easy to do and no more cranking an adjuster in or out. And it really does make a difference in the ride and performance of the motorcycle. Ride Mode Pro: This sets the Automatic Stability Control and throttle to one of 3 modes; Rain, Road or Dynamic (with the Pro option). The easiest way to describe it is from the throttle response section on the modes in the Rider’s Manual. In rain the throttle response is restrained and ASC intervenes early to prevent rear wheel slipping on wet roads. In road the throttle response in and stability is what you would normally expect. All I can say about Dynamic is WOW! It’s a sports performance mode. The throttle response is in no way restrained and is even quicker than normal mode. The ASC would intervene at the latest time and power transfer to the rear wheel is QUICK. The motorcycle was in dynamic mode when I picked it up and it flat-out took off. I pulled to the side of the road and figured out how to put it in normal mode. Hill Start Control is another that is not a “must have” to me. I’ve used it to see how it works. It’s designed to do just what it says, to start on a hill. Or more precisely to start a fully loaded motorcycle from a stop on a hill. While stopped you shift to neutral, squeeze the front brake lever quickly and firmly and it will set the rear brake. The motorcycle will not roll. To release it, just squeezed the front brake lever again or when driving off, just use a little more throttle than normal. It does work. I’ve found that I’ll use it when Donna is getting on or off the motorcycle or when fumbling for the garage door opener in the left glove compartment. While it’s convenient to have I wouldn’t miss it. The list goes on but those are some of the major options or the newer ones available. I’ll go over some of the others in future posts. Now I just wish it would warm up a bit for a pleasurable ride. Here in the south we can often ride year round but you don’t really want to do that when you wake up and it’s 7º F.
We hope you enjoy riding in 2015! Here it is a week before Christmas and Donna and I would like to wish our readers a Merry Christmas! This year we are continuing a tradition we started a few years ago with a personal motorcycle related Christmas card. Welcome to our 2014 edition. Whichever holiday you celebrate this season we hope that you find yourself surrounded by family and friends while good memories are created. We hope Santa stops by to see you too. For some of us he came a little early this year! This morning was the annual BMW Motorcycle Club of Georgia and BMW Motorcycles of Atlanta toy run for the Towns County Sheriff’s Office’s Empty Stocking Fund. The dealership acts as a drop off point for toys from customers and people who have heard about the ride through word of mouth. This year there were two large, motorcycle sized boxes full of toys. I wonder where they got those big motorcycle sized boxes? The toys are then usually loaded up in the dealership’s van and taken to the sheriff’s office by a caravan of motorcycles. The ride is open to all motorcycles and all they ask is that you bring one unwrapped toy the day of the ride or drop one off in the toy box before the ride. Of course the largest percentage of motorcycles are BMW but there were Ducatis, Hondas, Kawasakis, Triumph, Can Am Spyder and more. There were 46 motorcycles this year. There was even a family of four on a BMW with a side car! It’s a fun day. The owner’s of the dealership provide coffee and a light breakfast for the riders before the toys get loaded up. The sheriff is there at the justice center waiting for us to arrive. There are offices packed with donated toys at the justice center. The sheriff goes out of his way to thank the riders, often thanking as many as he can individually. The numerous ways the toys get distributed is really interesting too. Families can come pick up the toys and even have them wrapped if they are unable to it themselves. Deputies can meet parents to deliver toys, deputies can and do drop off toys on Christmas Eve, leaving them at a spot designated by the parents so they can retrieve them to be put under the tree and some toys are even delivered on Christmas by the deputies in person. It’s all based on what the family wants to do. Since it’s December the weather here can be frigid or warm. In the past we’ve been rained on, snowed on, iced on and had freezing fog. This was the first ride I’ve been on where it was sunny! On my way to the dealership this morning it was a crisp 32° (F). When we departed Marietta for Young Harris it had already warmed to 41° but when we got to Jasper the sun suddenly disappeared, it got overcast and the temperature rapidly dropped to 30°! As we got to Ellijay, the sun came out again and it warmed into the low 40’s but when we reached our pit stop in Blue Ridge it was 32° and freezing fog again. By the time we reached the justice center in Young Harris it was sunny again and 46°. Talk about roller coaster weather! But I think the cold weather and the frozen fog in the tree tops helps put you in the Christmas spirit and really does make us feel like two-wheeled Santas. After the toys are delivered we usually break up into smaller groups and head for lunch or to go do some riding in the area. Pit stop in Clue Ridge. That’s freezing fog in the distance! Well it’s that time of year again. WordPress has turned on the Christmas decorations. So depending on your browser, you’re seeing snow flakes floating across the screen. Well, in the previous post I vented about the differences in motorcycle dealers and the trouble in not only getting my top case delivered but the key being stuck in the lock. Earlier today, after I installed the lock cylinder and after BMW Motorcycles of Atlanta’s exemplary customer service I posted a picture on Twitter of the top case along with the text “Finally right! But with NO help from BMW of Daytona Beach but LOTS from BMW of Atlanta!” About 2 hours later I got a call from a representative from BMW Motorcycles USA about my social media posting. He explained that an employee whose job is to search social media sent the post to him. First he asked if there was a problem. Then he asked what happened and what each dealer told me or did. Then he wanted to know what could be done to resolve the situation if it had not already been resolved. It was a very friendly friendly and cordial phone call. I was actually surprised and impressed by the call. He even wanted to know if my R1200RT was a buy back motorcycle or involved in the recall. He admitted to not having yet read all the information about the purchase but wanted to reach out to see what happened and what could be done. I just hope they don’t call again about this post! I had the first nighttime ride tonight on the R1200RT. It’s pretty impressive. I had a friend and former co-worker pass away this past week and tonight was the visitation at the funeral home. We met when we were both Motor Officers. I felt it would be appropriate to ride the motorcycle to the funeral home and it seems so did some other former Motor Officers. It was just at sundown as I left the house and was heading east with the sun setting behind me. The R1200RT has an instrument panel that automatically dims or brightens dependant on the ambient light. This feature is pretty cool and in a stretch with some street lights I could actually notice it brighten and dim. In the dark the panel was easy to see and read. The GPS seemed to be a bit dark though. On battery power, the “auto dim” feature is disabled but I’ll have to check on that when it’s powered by the motorcycle. However, when I came home and it was good and dark, the GPS screen was easier to read. The headlight really lights up the road! The Magic Carpet, our retired K1200LT had been upgraded to a nice HID headlight before we bought it. The headlight on the R1200RT is an HID according to what the salesman told us but it doesn’t seem to have that crisp, white appearance the one on the Magic Carpet did. But on a road near home I played with the high beam and was amazed at how much it light up the road and how far the light went. It was also then that I noticed the low beam had a “whiter” light compared the slightly yellow of the halogen high beam lights so the low beam could well be an HID. You never really notice the very slight yellow of good halogen lighting until you see it compared to HID. I still have to get used to the locations of all the switches on the handlebars in the dark though. On the K1200LT the button for the hazard flashers was always illuminated when the ignition was on and because of that it was a good point of reference. I miss that benign little feature. Slablog Thoughts about motorcycling in general…riding…mechanical…whatever. I Just Want 2 Ride!! Our motorcycle blog about motorcycle stuff.